Today is census day in the UK, and anyone who has filled in the form will have noticed a question about cars, specifically asking about how many cars your household has access to. I neglected to mention the various press fleet cars I might get temporary access to this year, with any luck, and instead answered in the singular – we have the one Honda Civic hybrid parked on our drive. But it will be interesting to see if the numbers for 2011 continue the trends established over the past few decades. The number of households without a car has been steadily falling, but with a suggestion that the number might flatten out at about 20 per cent. 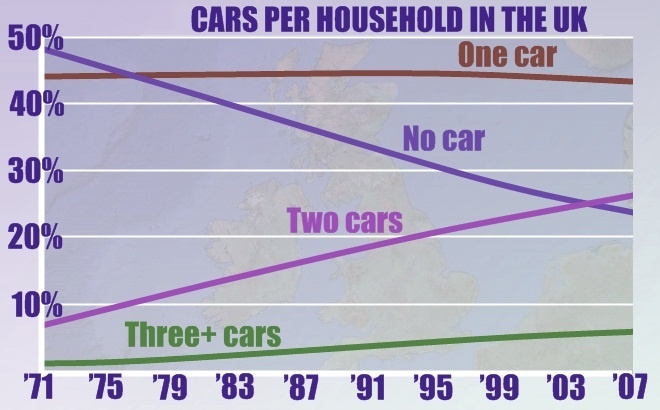 The proportion of families with just one car peaked in the mid-nineties and has dropped slightly, due mainly to the rise in ownership of multiple cars. Today’s census will give a clearer set of numbers, but the best official guesstimates suggest here are currently about 27 million households in the UK and about 31 million cars. About a quarter of households don’t have a car, about 45 per cent have one car, roughly a quarter have two cars, and the remaining five percent have three or more cars. Do the maths and this means that about 61 per cent – or 19 million of the cars on UK roads – are not the family’s sole means of transport. I, personally, think this is quite an encouraging number. Particularly as I’m interested in who might buy electric cars – a wonderful means of transport but one which will remain quite limited in practical driving range for the foreseeable future. If 61 per cent of cars are owned by multi-car households, it should follow that at least the same fraction of new cars will be bought by those same multi-car households. Of course, those families probably account for a greater proportion of new car purchases given that owning lots of cars tends to require a fairly well-stocked bank account. About two million new cars are sold each year in the UK, so there is a base potential market of about 1.2 million buyers, over the coming 12 months, for whom the restricted range of an EV may well not be an issue, because they have at least one other car in the household that might be used for longer trips. I’m not saying that all of the 1.2 million buyers milling around showrooms looking to replace just one of their cars ought to buy an EV. Many families no doubt need every one of their cars to be capable of slogging from Devon to Dumfries on a regular basis. But equally, many, many thousands of buyers will be looking for a simple runabout, capable of nipping to the shops or plodding to the school gates and back. Over the coming years, many may decide that a battery-powered car really does fit the bill. As the numbers above illustrate, almost one in three cars on the road could potentially be an electric car. And what different roads they would be if that switch were to happen. I wonder how many cars will actually be electric, when the next census rolls around in 2021.